Flexible Specialty Products manufacturers fabric expansion joints using a variety of gas barrier materials, as well as layered composite refractory materials. 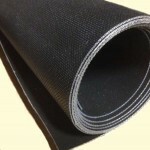 Our outer gas barrier is a PTFE based fabric material that is often reinforced with a PTFE coated fiberglass cloth. Our Multi-Flex materials is our most versatile and economical material. It is a two layer composite material that includes a PTFE-coated fiberglass cloth with a 5 mil PTFE film laminated to the interior side. This material is well suited for dry environments such as fans and blowers, ventilation air duct, and process air applications up to 600F. 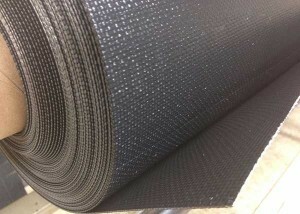 The versatile material is a durable fabric that can be fabricated in many shapes and is easily repairable. Our ChemFlex series composite fabric is used for wet or dry application and comes in three grades. The ChemFlex 9 has a 9mil PTFE film laminated to a PTFE coated fiberglass cloth and provides good resistance to chemical attack. Our ChemFlex 12 and ChemFlex 20 use a 12 mil and 20 mil PTFE interior film for protection respectively. The 20 mil PTFE film is the thickest available in the industry and provides superior protection for highly concentrated chemical attack. All of our ChemFlex materials are rated to 600 F and can also be provided with a conductive PTFE film to reduce static charge in the system. The ToughFlex material is used for applications with light abrasives in the flow path. 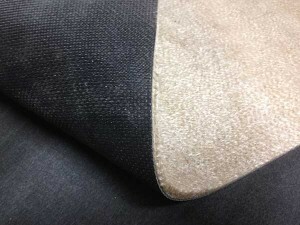 The material is a three-layer composite with a 12 mil PTFE film in the center of two layers of PTFE coated cloth. This additional interior layer provides protection of the PTFE film as well as providing a very tough, durable material for higher pressure and abrasive conditions. 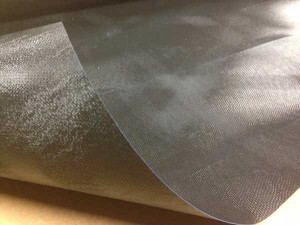 For very abrasive conditions, we can add flow liners to protect the fabric materials from direct contact with the particulate. SuperFlex-30 and SuperFlex-40 are 100% PTFE fabrics without any fiberglass reinforcing. These materials are ideal for applications requiring extreme flexing or pulsations as well as severe acid attack. This extremely flexible material is available in a 30 mil thickness (SuperFlex-30) and 40 mil thickness (SuperFlex-40) to meet the strength and flexibility requirements of your specific application. The Flex850 and Flex1000 materials are high-temperature composite materials with interior fiberglass insulation laminated directly to the PTFE-coated fiberglass. The Flex850 is rated for temperatures up to 850 F and has a 100oz woven fiberglass cloth laminated to the interior side. This durable and flexible composite material can be fabricated into many shapes to meet your specific requirements. The Flex1000 is rated for continuous temperatures of 1000 F and has a ½” thick fiberglass mat attached to the interior side. This composite material is well suited for high-temperature applications requiring extra thermal protection. Flexible Specialty Products also offers a full line of layered composites for flat joint frame style configurations using our MultiFlex or ChemFlex series along with various refractory materials. We use needled fiberglass blanket, ceramic fiber blanket, vermiculite-coated fiberglass cloth, ceramic felt, and silica cloth. These multi-layer composites can be designed for temperatures up to 1800 F. Contact FSP to discuss your specific options that will meet your needs.